As Ash Wednesday morphs into Lent Madness Eve, the stage is set for the start of the 2015 edition of “The World’s Most Popular Online Lenten Devotion”®. Tomorrow’s opening match-up between Gregory the Illuminator and Brendan the Navigator will go live at precisely 8:00 am Eastern Standard Time. Read about both saints and then vote (once!). If you’re new to Lent Madness you may want to participate by leaving a comment — many people do and it’s fascinating to learn why people vote the way they do, how a particular saint has touched them or why they identify with or connect with a certain person or story. Sure, sometimes you might vote for a saint just because you like her name but often the reasons run much deeper. In a very tangible way, this is how the Lent Madness community is formed and it’s fun to check back throughout the day to see what people have posted. Now, we know that all over the world, people are marking Lent Madness Eve. According to news reports, thousands have gathered in Times Square to watch the Halo drop. Others are popping non-alcoholic beverages and refraining from consuming chocolate. We thought we’d offer a few suggestions for making your Lent Madness Eve both meaningful and safe. Here is a top ten list of activities to engage in as you keep vigil until 8:00 am EST. 1. Wipe the ashes off your forehead (if you’re a member of the clergy, scrub your thumb). 2. Compose lyrics to a new song to which no one actually knows all the words: Auld Lang Halo. 3. 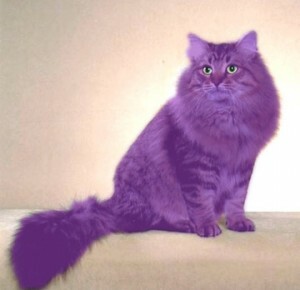 Spray paint the cat purple. 4. Break into the parish office to redo the bracket you initially filled out and submitted, because you’re having second thoughts about your picks. 5. Eat anything but pancakes. 6. Call your mother to wish her a Happy Lent Madness Eve. 7. Dress up as your favorite saint and then go out to the drugstore to buy cold medicine for your sick kid. 8. Wallpaper your powder room with poster-sized brackets. 9. Cyber stalk one of the Celebrity Bloggers. 10. Become your own personal Lent Madness noisemaker by yelling “saint, saint, saint!” at everyone you encounter. Try to get some sleep. It’s going to be a big day tomorrow. At least with an Illuminator and a Navigator duking it out, you won’t have to worry about being lost in the dark. 43 Comments to "Happy Lent Madness Eve!" (sung happily) It’s the most wonderful time … of the year! I have to take this opportunity to shamelessly hype Brendan the Navigator! One of my all-time favorite books was Tim Severin’s “The Brendan Voyage” (1978). He studied the text of Brendan’s journey across the North Atlantic, built his own curragh, researched the ancient skills of working leather etc., hired a Viking descendant with all the ancient lore, and convinced me that Brendan had indeed navigated his way to the New World long before the Vikings or that rude Italian. I tried to spray paint my Episco German Shepard dog and it didn’t go well. ….Time to AWAKE and let the Spirit of LENT to drive! You are invited to join in and have a part in the upcoming Forum potluck and program on Sunday, March 15th, starting at 6 p.m. Building on our Lenten theme of learning about the lives of many of our wonderful and somewhat eccentric saints, we will have a one-night “Saint-Off” contest to determine who is the most popular saint among this year’s LentMadness contestants. Each of you has been assigned to a saint. When your saint is matched up that night you will be asked to share a compelling anecdote about your saint in hopes of convincing those present to vote for your saint rather than the saint you are matched up against. Feel free to be creative with visual aids, etc. if the Spirit moves you. Otherwise, concentrate on sharing something compelling about them. After all contests have been completed and the winner selected, you will receive a golden halo if your saint wins. Please reply and confirm whether you will be able to assume this honor. This will be great fun and we will all learn a great deal! I especially liked the reminder to clergy to scrub their thumbs! We always forget to have a towelettes in the chancel area for after! Any hints about how to avoid giving some recipients “ash freckle sprinkles”? Try mixing the ash with some Chrism – no more “ash freckles” and it smells good too! Our church wets the ashes. It makes a cleaner, more lasting mark, and kills the sprinkle problem. Rub thoroughly with sliced lemon! It will remove most of the ash. Be careful if you have a cut! rinse with lemon, wipe dry with a slice of bread–probably because the holy ashes can be more easily returned to the earth on the bread than on a cloth. This tradition is older than paper towels which compost nicely. Yeah it’s here…..Going for mug number 3 this year! 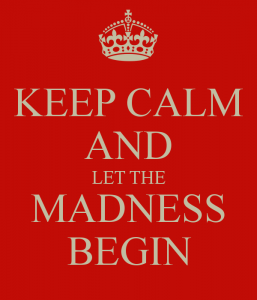 Really excited that Lentmadness has come round at last. We are ready! My Aunt Jan and I do the brackets together. She is in CA and I’m in TN and so every day when the Lent Madness e-mail arrives, and she is having her coffee, I give her a call. We read about the saints and then decide for whom we will cast our vote. (By the way we participated last year and cast our one vote for Thomas Merton, but I am drinking quite happily from the Charles Wesley cup.) If you have someone you’d love to spend some phone time with, try this way of sharing the madness. This is my first Lent Madness! So excited to see what it’s all about! This is my first Lent Madness ! Sounds exciting! I saw the great tips about ashes too late to suggest them this year, but I’ll save them for next year. I noticed some ash got on the fair linen and it will have to be washed for the second time this week. Aargh. Next year, have the altar guild set up the following on the credence table: one wet paper towel (in a small bowl) one dry paper towel and a plastic baggie to put both things in after use. At the end of the ashes, hurry up to the officiant and assist. Another thing: my altar guild thinks it’s heresy, but clear plastic on the fair linen for this occasion can be a mercy. The church we were at tonight had a clear plastic protector which caught the ash that escaped in spite of the best precautions. If you have acolytes on duty, clue them in, bribe them, or whatever it takes to get them to help. We do not put any of the items on the Altar. We set up a small tea cart (same one we use for Baptismal items) and on the cart is the small dish of ashes, tissue, and facial wipes (the kind you use to wipe off make-up) Diaper wipes would work, too, but our priest thought that just sounded yucky (of course, that was last year, before the baby – now, I suppose he is quite familiar with them! LOL) And, our priest also wets the ashes just a bit, as was mentioned above, to assist in the “sticking” quality. I’m ready to rumble. This really is fun and educational too. Thank you Tim and Scott for your humor and creativity! – Will the SEC be able to maintain their detente while fending off the critics (remember; Lent Madness is OPTIONAL!)? – Will the Celebrity Bloggers be able to stay healthy and whole through the entire LM season? – If a saint decides to leave the competition, will they be killed off? Oh wait, that’s Downton Abbey, and besides, they are already dead. – and what about Maple Anglican? Hey, wait, what ABOUT Maple Anglican? No profile? No videos from the Archbishops? Are they in contract negotiations still? What’s going on here? Maple Anglican has indicated that he is taking time off this year to attend to a busy life., so it seems that for his fans (like me) our 2015 Lenten discipline is going to be ‘giving up Clairvoyatron videos’. Heavy sigh. I’m looking forward to learning about some lesser known saints. This is my first Lent Madness. Bring it on!! This will be my third LM and my husband’s first. We are both looking forward to the voting. A happy lent madness to all. I’m so excited. Don’t think I’ll get any sleep tonight! Finally a Lenten Observation I can share with my husband. It’s like Christmas Eve at our house. It’s tough deciding which cat should get the honor. I didn’t think we’d have to make a decision until tomorrow. I’m grateful that we only have to pick one out of two choices for Lent Madness, but the cat issue isn’t so simple. Difficult to choose between Brendan and The Illuminator! I must say I did NOT find the theological debates very illuminating! Hypostatic and all that! Who said that the Church was split over an iota? ‘Of one nature’ or ‘of the same nature’ ? This is my first year in, and looking forward to reading about saints. thereby not breaking my Lenten resolution! Instead I will look for ways to rejoice in the little things in daily life! 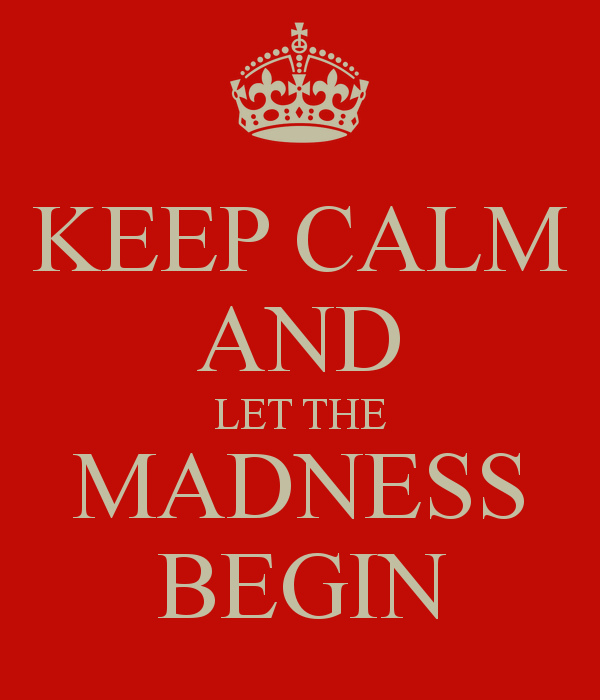 Yes, let the Madness begin – it’s already 9am where I am, what’s keeping you chaps? Love the 10 things to do (but don’t really spray the cat). Wishing everyone on your side of the pond a blessed and mildly fun-filled Lent. A trick I leaned at CREDO. One packet or teaspoon of sugar in the palm of your hand, add a squeeze of lemon juice, rub vigorously and then rinse off. Leaves your hands beautiful, soft, and definitely ash free. Best scrub ever. Weather kept me from receiving ashes. But that will not dampen my Lenten experience . Thanks to All Saints, Mobile AL, for their email newsletter giving info about this wonderful website. I hope to involve St. Andrew’s, Encinitas CA, where I am now. A devout agnostic here. This is the first bracket I’ve seen, and I haven’t seen the older ones, but I have two questions: (1) Which Kamehameha is supposed to be in the bracket? (2) Why not the great Liliuokolani, a personal heroine of mine? I’m having some problems connecting to the Clairvoyatron 2100. Are the Archbishops cognizant of the various changes in security, network topology, and most importantly–if they are with us this year, are they using iOS or Android?